Ellis was born in Kirby Muxloe, Leicestershire, into the prominent Leicestershire Quaker family, and was educated at Bootham School, the famous Quaker school in York. Having started as successful farmers in the early 19th century, different branches of the Ellis family soon expanded into business, particularly in the extraction industries of lime, slate, coal and granite. Soon they became merchants for all these commodities and for many more products besides. They were also involved in banking, building societies and insurance, and from their humble beginnings many of their businesses continue today as part of larger conglomerates. Alongside their strong commercial base the family’s strong adherence to their Quaker beliefs meant that they were very concerned with social welfare and committed in their work to support hospitals, schools, charities and the temperance movement. Herbert Ellis was the son of James Ellis, described in the 1861 Census as a farmer and coal and lime merchant, and the grandson of John Ellis (1790 – 1857) of Beaumont Leys and Belgrave Hall. 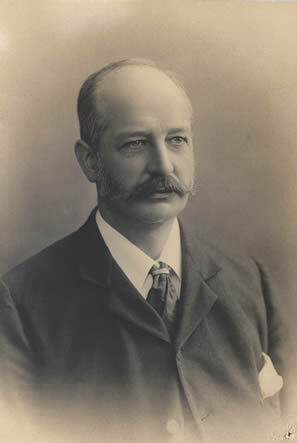 John Ellis was a nationally important pioneer in railway development. He promoted and chaired the first commercial railway anywhere in the Midlands in 1832-33, the Leicester and Swannington Railway, which opened up the Leicestershire coalfield and the major stone quarries of Charnwood Forest, massively increasing the profitability of their production through much lower transport costs. This was followed by the Midlands Counties Railway (later Midland Railway) of 1844, which linked the East Midlands counties and their freight and passengers to London and the rest of the growing national railway network. Under John Ellis the family businesses already included quarrying and the sale of coal, stone and builders’ supplies, and following his death the industrial and commercial empire was divided between the railway, coal-mining and the growing financial interests and the quarrying and builder’s merchant businesses. Herbert’s father James, with his brother Joseph, developed the latter group of business interests. In 1858, the year after the death of John Ellis, James and Joseph Ellis entered into a partnership with Breedon Everard of Bardon House, near Coalville, coal and stone merchant and the lessee and proprietor of the Bardon and Markfield stone quarries to form Ellis and Everard, coal, stone and builders’ merchants of Leicester. The new partnership carried out major developments at Bardon, including an innovative steam-powered stone crusher. Herbert Ellis joined his father in Ellis and Everard, and in due course successfully carried the company forward with the next generation of the Everard family: Thomas Everard and John Breedon Everard. Workmen’s cottages, a school and a reading room were built by the company, followed in 1898 by a parish church which was supported by an annual contribution to meet part of the clergymen’s stipend, and in 1908 Herbert Ellis was the joint signatory with Thomas and John Breedon Everard on a new 32 year lease for 118 acres of Bardon Hill. The Everards continued to live at Bardon, while Herbert Ellis’s house was The Gynsills, Glenfield (later the home of William Keay, Lit. and Phil. President for 1927-28). At the same time the stone and builders’ merchant business of Ellis and Everard continued to grow (and like a number of other Ellis enterprises) still exists today, though as parts of international conglomerates, notably Aggregate Industries plc. Herbert Ellis joined the Lit. and Phil. in 1886, and after his presidential year remained a member to his death, in later years as an Honorary Vice-President of the Society. Record Office for Leicestershire, Leicester and Rutland: Lease of land for quarrying and railways etc. at Bardon Hill, near Coalville, from Herrick Estates, Beaumanor Hall, Leics., 1908.